Junior Minister for Mental Health and Older People, Jim Daly TD, is in New Zealand this week, as part of a ‘Promote Ireland’ programme around St Patrick’s Day. 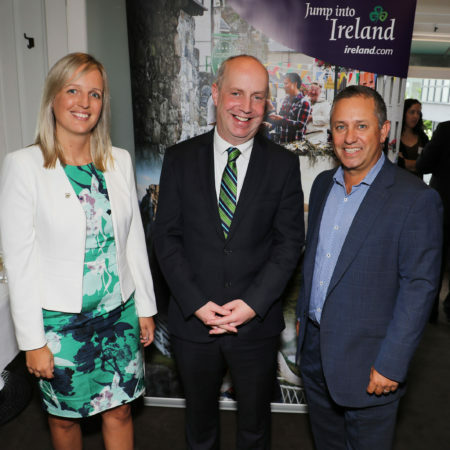 The minister’s busy schedule included an event organised by Tourism Ireland, which was attended by 40 leading New Zealand travel trade, airline representatives and travel journalists. Auckland, New Zealand – Sofia Hansson, Tourism Ireland; Minister Jim Daly; and Mark Pirihi, Cathay Pacific Airways, at Tourism Ireland’s St Patrick’s event in Auckland, New Zealand. Guests at the event included cooking duo Karena and Kasey Bird – former winners of MasterChef New Zealand – who visited Ireland last year, to film an episode of their popular TV show, Karena And Kasey’s Foreign Flavours. The show aired last month to around 250,000 viewers across New Zealand. St Patrick’s Day celebrations will kick off as the sun sets on 17 March in New Zealand, with the iconic Sky Tower in Auckland set to light up in green, as part of Tourism Ireland’s Global Greening initiative. Other sites set to go green include the Auckland Harbour Bridge, Christchurch Airport, the Michael Fowler Centre in Wellington and Eden Park in Auckland (New Zealand’s most famous rugby stadium). The ‘green wave’ will then continue around the world, with hundreds of landmark buildings and iconic sites around the world set to take part in Tourism Ireland’s Global Greening initiative, to celebrate St Patrick’s Day and the island of Ireland. Most ‘long-haul’ travel is still booked through a travel agent in New Zealand. As a result, co-operative promotions with the influential travel trade is a key element of Tourism Ireland’s activity in New Zealand. For example, Tourism Ireland will work with both Helloworld and Flightcentre during 2018, highlighting flights to Ireland via Hong Kong with Cathay Pacific. Tourism Ireland’s publicity drive in New Zealand also continues throughout the year, generating positive coverage for the island of Ireland.